A special retirement service will be held for Mark Rutledge, senior pastor of Praise Point UB church (Willshire, Ohio). An open house will be held the same day from 1-3 pm. 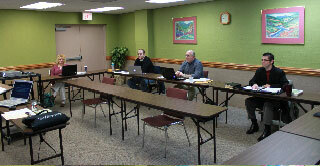 These five persons attended the UB History course held at Rhodes Grove Camp. L-r: Amy Moreno, Matthew Hann, Jeff Stansbury, David Grove, and Adam Lane. 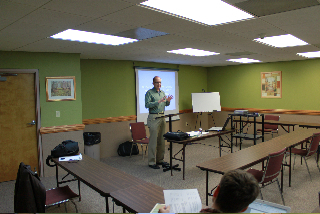 Daryl Elliott teaching the class. The annual United Brethren History course, a requirement for becoming a licensed UB minister, is being held in two regional settings this year. February 21-22 at Rhodes Grove Camp in Chambersburg, Pa.
March 7-8 in Wayne, Ohio. 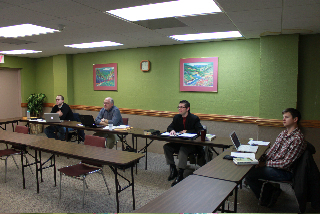 Five persons attended the course at Rhodes Grove Camp, which was taught by Daryl Elliott, pastor of Fountain UB (Keyser, W. Va.). Matthew Hann, Associate Pastor of Care and Worship at Jerusalem Chapel (Churchville, Va.). Jeff Stansbury, from Idaville UB (Idaville, Pa.). David Grove, senior pastor of Ebenezer UB (Greencastle, Pa.). Adam Lane, Worship/Youth Director at Blue Rock UB (Waynesboro, Pa.). Rotary International, in partnership with Engineers without Borders, has signed a five-year agreement with Centennial Secondary School in Matttru Jong, Sierra Leone. They will rehabilitate damaged buildings, and provide electricity and water supply. The school was ravaged by rebel forces during the civil war of the 1990s. According to the online Awoko Newspaper, a team of experts from Engineers without Borders recently visited the school to assess the existing facilities. Diana Dunn, the team spokesperson, said they intend to install a solar lighting system and repair roofing (the school foundations, she said, appear sound). She also noted that the one shallow well on the campus usually dries up during the dry season. LivingstonDaily.com published a mini-profile on Mark Wilson, who became senior pastor of Fowlerville UB (Fowlerville, Mich.) in May 2010. He is new to the United Brethren denomination, having previously served as family pastor at Kentwood Community Church in the Grand Rapids, Mich., area. Darlene Burkett with Box Number 1. 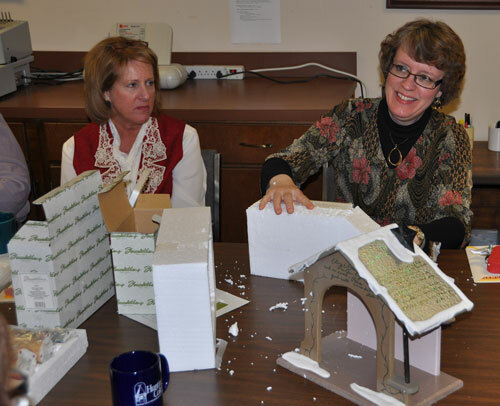 Peggy Sell (left) and Darlene Burkett. 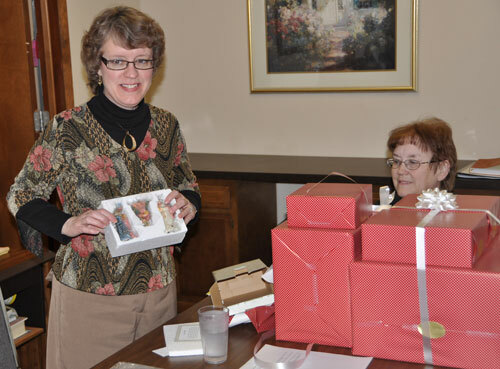 On Wednesday, February 23, the Healthy Ministry Resources staff recognized Darlene Burkett for her seven years as Administrative Assistant to Global Ministries. As reported earlier, Darlene will complete her work at the national office next week. Darlene and her husband, Phil, will load up a truck on Friday, March 4, and move to Cass City, Mich., where Phil will become senior pastor of the Cass City Missionary Church. Until the end of 2010, Phil was Minister of Music and Worship at College Park Church in Huntington, Ind. 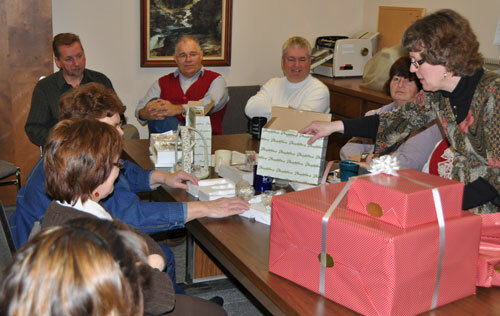 During the morning break time, the staff presented a bunch of nicely-wrapped gifts to Darlene. Each box held part of a large, elaborate nativity set. Darlene collects nativity sets. Then, over lunch, the staff went to downtown Huntington to the Brick House Grill, where Phil was waiting. Everyone enjoyed a nice meal together as a send-off for Darlene. She’ll be back next week to continue training her replacement, Peggy Sell. But after that, Peggy will be on her own. We at the national office wish Phil and Darlene well as they begin this new venture. 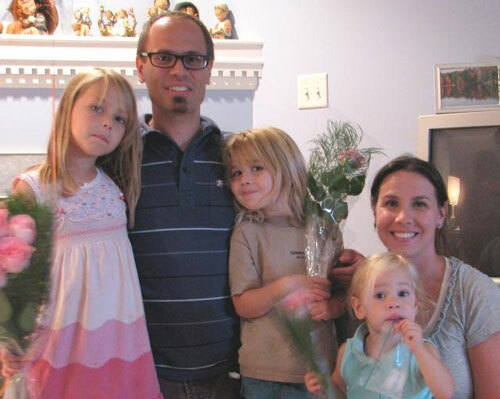 Mark Vincenti is the new youth pastor at College Park Church in Huntington, Ind. He joined the staff February 1. Mark has spent the past ten years serving as youth pastor at King Street United Brethren Church (Chambersburg, Pa.). Mark served as a youth ministry intern at College Park while attending Huntington University over 10 years ago. While at HU, Mark met Angela McNew and soon realized that he had met his future wife. He and Angela have three girls: Kiana (7) Naomi (4), and Asha (2). Roger Vezeau (right), the current Associate Pastor of Youth and Young Adults, and Mark will work together in the leadership of the youth ministry through the end of May. At that time, Roger will hand off the leadership reigns of the youth ministry and Mark will considered the lead youth pastor. Rev. Fred A. Miller, 87, passed away February 10, 2011. He served as a pastor for 45 years, including the UB churches in Modesto, Calif., and Philomath, Ore. He then worked 23 years with Oregon Nursing Home Ministries. Fred is survived by his wife, Jane, whom he married in 1943. They had five children. The funeral was held February 18 at Siskiyou Perl Chapel in Medford, Oregon, where he lived. The medical team and national workers. Jane Baker is in the middle (red top), with Ron right behind her. Ron Baker performing surgery at Mattru Hospital. 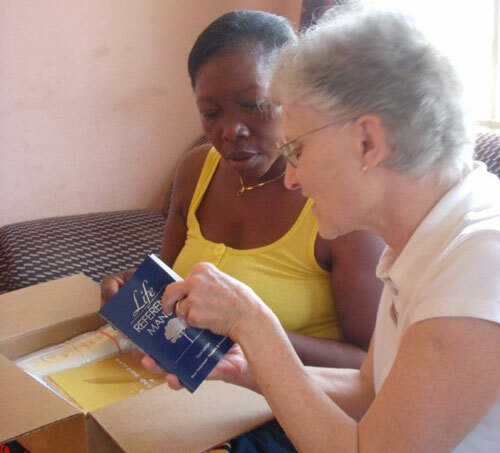 Jane Baker sharing Scripture with a Sierra Leonean. 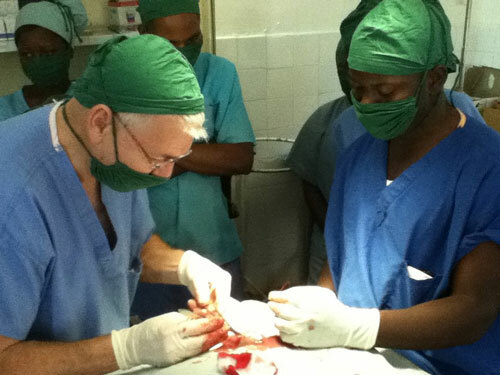 Dr. Ron Baker led a team to Mattru Hospital in Sierra Leone, January 18-28, 2011. 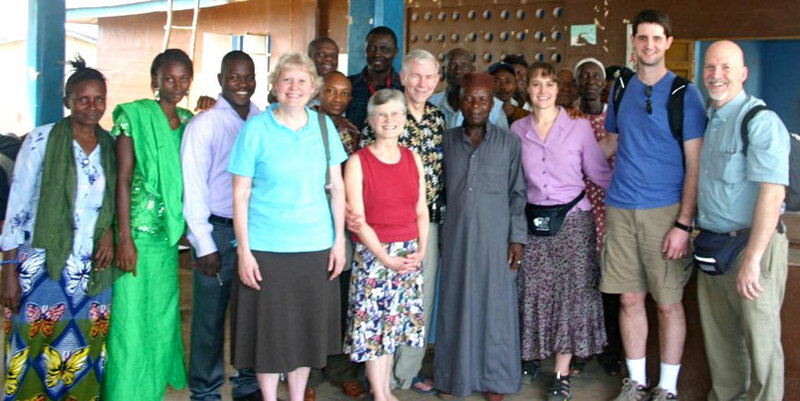 While Ron has made several trips back to Sierra Leone over the years, this was the first time his wife, Jane, has returned since they left the field in the 1980s. Accompanying them were Luke and Shannon Brown and Roger and Denise Cable. Ron and Shannon were the only medical personnel on this team. While some of the team did medical work at the hospital and others helped with maintenance, Jane was led from house to house to encourage, admonish, and share God’s Word with everyone she met. She was able to catch up with old friends, meet some who had come to faith in Christ since they left Sierra Leone, and share the Gospel with those still on a journey of faith. Global Ministries has been asked by Ron and Brenda Anderson, endorsed missionaries in Spain, to send a team of four persons to do a family English Camp outside of Madrid July 15-17, 2011. Departure date would be Tuesday, July 12, and they would return on Tuesday July 19. Dates: Tuesday, July 12, through Tuesday, July 19. The camp would focus on the Two Toledos–Toledo, Ohio, and Toledo, Spain. There would be several opportunities to teach conversational English to the participants through workshops, childrens sessions, and special activities. Teaching credentials are not a requirement for this ministry opportunity. If you are interested, please contact or by calling toll-free at 888-622-3019, ext. 305.